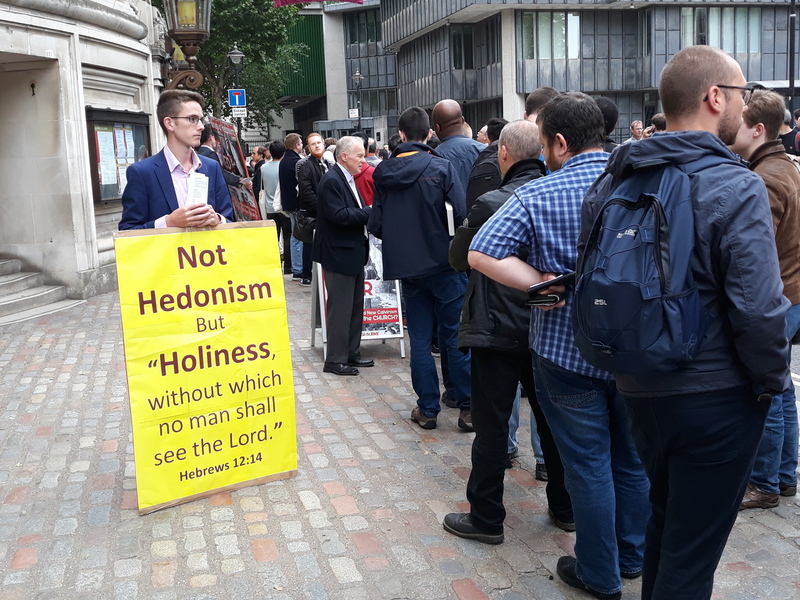 Celebrity American Pastor John Piper addressed thousands of men at the London Men’s Convention held in Central Hall, Westminster on 2 June 2018. Piper had been invited to speak at the London Men’s Convention by Richard Coekin, Director of Co-Mission. 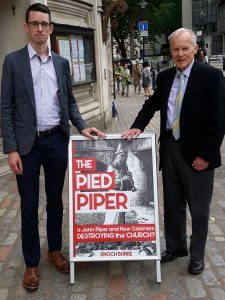 The presence of John Piper in London was a cause for concern to many Christians. Piper’s preaching of “Christian hedonism” has been accompanied by a rapid rise in worldliness among churchgoers. As an expression of this concern, a protest was held outside Central Hall in by Dr ES Williams, Enoch Burke and others from the UK and Ireland. The protest consisted of several posters, as well as the distribution of literature explaining concerns around John Piper. 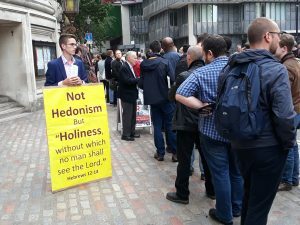 One poster read “Not Hedonism, but Holiness ‘without which no man shall see the Lord’ – Hebrews 12:14.” Further posters featured the book covers of two books recently published refuting John Piper: Christian Hedonism: A biblical examination of John Piper’s teaching by ES Williams and The Pied Piper: Is John Piper and New Calvinism Destroying the Church? by Enoch Burke. Copies of these books were distributed by the authors throughout the day. 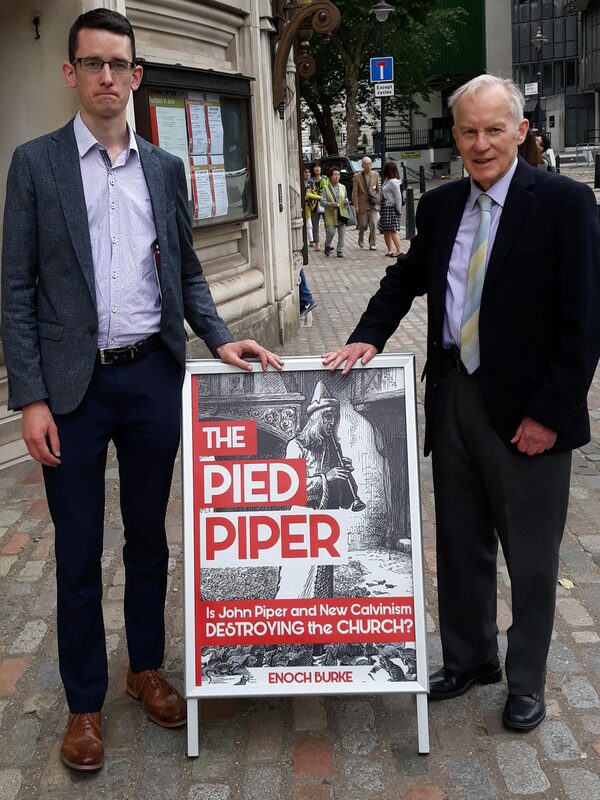 Prior to the morning session hundreds of men filed past the protest at the entrance to Central Hall and received a leaflet outlining the false doctrine laced throughout Piper’s teaching. Several attendees tore up or binned the leaflet and were aggressive in their response to the protest. However, many good conversations were had with others, who confessed that, although attending the conference, they had doubts regarding Piper’s message.